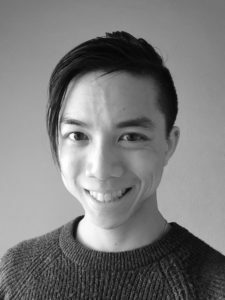 Justin Yi-Wei Lau – Writer. Editor. Born in Singapore and raised in Japan as a Third Culture Kid (TCK). Bilingual but feels most comfortable speaking Japlish, a hybrid of Japanese and English (not to be confused with Engrish). Writes Japan-related fiction, which have been published in The Missing Slate, Bunbury and elsewhere. Also writes essays on (multi)cultural identity and spiritual faith. Editor-in-chief of Transect Magazine, a literary magazine that showcases short stories and poetry written by multiculturals worldwide. Transect has published work from 29 countries. BA and MA in English Literature from Durham University, UK. Specialised in comics studies, focussing on Neil Gaiman’s The Sandman (BA) and Craig Thompson’s Blankets and Habibi (MA). Currently based in Durham, UK. Working on his first novel set in the UK and Japan, as well as a co-authored middle grade fantasy novel entitled Megumi, Karim, and the Nanairo Dreamland.